AT Roosendal, about an hour's railway journey from Antwerp, the boundary between Belgium and Holland is crossed, and a branch line diverges to Breda. Somehow, like most travellers, we could not help expecting to see some marked change on reaching a new country, and in Holland one could not repress the expectation of beginning at once to see the pictures of Teniers and Gerard Dou in real life. We were certainly disappointed at first. Open heaths were succeeded by woods of stunted firs, and then by fields with thick hedges of beech or alder, till the towers of Breda came in sight. Here a commonplace omnibus took us to the comfortable inn of Zum Kroon, and we were shown into bedrooms reached by an open wooden staircase from the courtyard, and quickly joined the table d'hote, at which the magnates of the town were seated with napkins well tucked up under their chins, talking, with full mouths, in Dutch, of which to our unaccustomed ears the words seemed all in one string. Most excellent was the dinner -roast meat and pears, quantities of delicious vegetables cooked in different ways, piles of ripe mulberries and cake, and across the little garden, with its statues and bright flower-beds, we could see the red sails of the barges going up and down the canals. As soon as dinner was over, we sallied forth to see the town, which impressed us more than any Dutch city did afterwards, perhaps because it was the first we saw. The winding streets - one of them ending in a high windmill - are lined with houses wonderfully varied in outline, and of every shade of delicate colour, yellow, grey, or brown, though the windows always have white frames and bars. Passing through a low archway under one of the houses, we found ourselves, when we least expected it, in the public garden, a kind of wood where the trees have killed all the grass, surrounded by canals, beyond one of which is a great square chateau built by William III. of England, encircled by the Merk, and enclosing an arcaded court. There was an older ch�teau of 1350 at Breda, but we failed to find it. In stately splendour, from the old houses of the market-place, rises the noble Hervormde Kerk (Protestant Church), with a lofty octagon tower, and a most characteristic bulbous Dutch spire. Here, as we wanted to see the interior, we first were puzzled by our ignorance of Dutch, finding, as everywhere in the smaller towns that the natives knew no language but their own. But two old women in high caps and gold earrings observed our puzzledom from a window and pointed to a man and a key - we nodded; the man pointed to himself a door, and a key - we nodded and we were soon inside the building. It was our first introduction to Dutch Calvinism and iconoclasm, and piteous indeed was it to see so magnificent a church thickly covered with whitewash and the quantity of statues which it contains of deceased Dukes and Duchesses of Nassau bereft of their legs and petticoats. Only, in a grand side chapel on the left of the choir, the noble tomb of Engelbrecht II. of Nassau, general under the Emperor Maximilian (1505), remains intact. The guide lights matches to shine through the transparent alabaster of the figures that of the Duke represents Death, that of the Duchess Sleep, as they lie beneath a stone slab which bears the armour of Engelbrecht, and is supported by figures of C�sar, Hannibal, Regulus, and Philip of Macedon; that of C�sar is sublime. The tomb of Sir Francis Vere in Westminster Abbey is of the same design, and is supposed to be copied from this famous monument. Outside the chapel is the tomb of Engelbrecht V. of Nassau, with all his family kneeling, in quaint headdresses. The other sights of the church are the brass font in the Baptistery, and a noble brass in the choir of William de Gaellen, Dean of the Chapter, 1539. 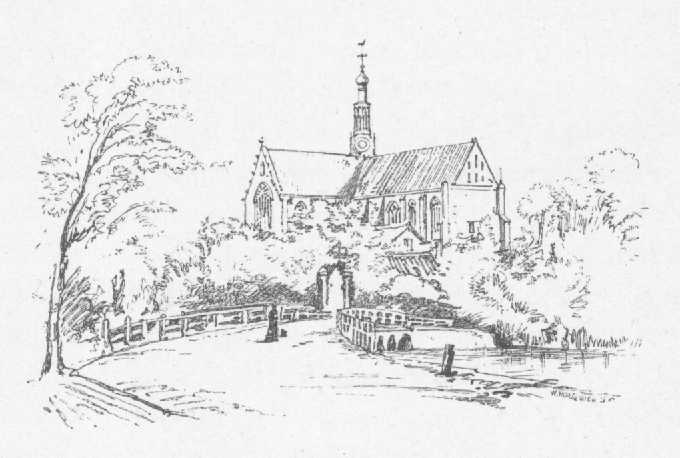 It will be observed that here, and almost everywhere else in Holland, the names of saints which used to be attached to the churches have disappeared the buildings are generally known as the old church, or new church, or great church. After a delicious breakfast of coffee and thick cream, with rusks, scones, and different kinds of cheese, always an indispensable in Dutch breakfasts, we took to the railway again and crossed Zealand, which chiefly consists of four islands, Noordt Beveland, Zuid Beveland, Schouwen, and Walcheren, and is less visited by the rest of the Netherlanders than any other part of the country. The land is all cut up into vast polders, as the huge meadows are called, which are recovered from the sea and protected by embankments. Here, if human care was withdrawn for six months, the whole country would be under the sea again. A corps of engineers called 'waterstaat' are continually employed to watch the waters, and to keep in constant repair the dykes, which are formed of clay at the bottom, as that is more waterproof than anything else, and thatched with willows, which are here grown extensively for the purpose. If the sea passes a dyke, ruin is imminent, an alarm bell rings, and the whole population rush to the rescue. The moment one dyke is even menaced, the people begin to build another inside it, and then rely upon the double defence, whilst they fortify the old one. But all their care has not preserved the islands of Zealand. Three centuries ago, Schouwen was entirely submerged, and every living creature was drowned. Soon after, Noordt Beveland was submerged, and remained for several years entirely under water, only the points of the church spires being visible. Zuid Beveland had been submerged in the fourteenth century. Walcheren was submerged as late as 1808, and Tholen even in 1825. It has been aptly asserted that the sea to the inhabitants of Holland is what Vesuvius is to Torre del Greco. How well its French name of Pays-Bas suits the country! De Amicis says that the Dutch have three enemies - the sea, the lakes, and the rivers; they repel the sea, they dry the lakes, and they imprison the rivers; but with the sea it is a combat which never ceases. And drown a province, does but spring a leak. The peasant women at the stations are a perpetual amusement, for there is far more costume here than in most parts of Holland, and peculiar square handsome gold ornaments, something like closed golden books, are universally worn on each side of the face. So, crossing a broad salt canal into the island of Walcheren, we reached Middleburg, a handsome town which was covered with water to the house tops when the island was submerged. It was the birthplace of Zach Janssen and Hans Lipperhey, the inventors of the telescope, c. 1610. In the market-place is a most beautiful Gothic townhall, built by the architect Keldermans, early in the sixteenth century. We asked a well dressed boy how we could get into it, and he, without further troubling himself pointed the way with his finger. The building contains a quaint old hall called the Vierschaar, and a so-called museum, but there is little enough to see. As we came out the boy met us. 'You must give me something: I pointed out the entrance of the Stadhuis to you.' In Holland we have always found that no one, rich or poor, does a kindness or even a civility for nothing! The crowd in the market-place was so great that it was impossible to sketch the Stadhuis as we should have wished, but the people themselves were delightfully picturesque. The women entirely conceal their hair under their white caps, but have golden corkscrews sticking out on either side the face, like weapons of defence, from which the golden slabs we have observed before were pendant. The Nieuwe Kerk is of little interest, though it contains the tomb of William of Holland, who was elected Emperor of Germany in 1250, and we wandered on through the quiet streets, till a Gothic arch in an ancient wall looked tempting. Passing through it we found ourselves in the enclosure of the old abbey, shaded by a grove of trees, and surrounded by ancient buildings, part of which are appropriated as the Hotel Abdij, where we arrived utterly famished, and found a table d'hote at 2.30 P.M. unspeakably reviving. Any one who sees Holland thoroughly ought also to visit Zieriksee, the capital of the island of Schouwen but the water locomotion thither is so difficult and tedious that we preferred keeping to the railways, which took us back in the dark over the country we had already traversed, and a little more, to Dortrecht, where there is a convenient tramway to take travellers from the station into the town. Here, at the H�tel de Fries, we found comfortable bedrooms, with boarded floors and box-beds like those in Northumbrian cottages, and we had supper in the public room, separated into two parts by a days for strangers, whence we looked down into the humbler division, which recalled many homely scenes of Ostade and Teniers in its painted wooden ceiling, its bright, polished furniture, its cat and dog and quantity of birds and flowers, its groups of boors at round tables drinking out of tankards, and the landlady and her daughter in their gleaming gold ornaments, sitting knitting, with the waiter standing behind them amusing himself by the general conversation. Our morning at Dortrecht was very delightful, and it is a thoroughly charming place. Passing under a dark archway in a picturesque building of Charles V. opposite the hotel, we found ourselves at once on the edge of an immense expanse of shimmering river, with long rich polders beyond, between which the wide flood breaks into three different branches. Red and white sails flit down them. Here and there rise a line of pollard willows or clipped elms, and now and then a church spire. On the nearest shore an ancient wind mill, coloured in delicate tints of grey and yellow, surmounts a group of white buildings. On the left is a broad esplanade of brick, lined with ancient houses and a canal with a bridge, the long arms of which are ready to open at a touch and give a passage to the great yellow-masted barges, which are already half intercepting the bright red house-fronts ornamented with stone, which belong to some public buildings facing the end of the canal. With what a confusion of merchandise are the boats laden, and how gay is the colouring, between the old weedy posts to which they are moored! It was from hence that Isabella of France, with Sir John de Hainault and many other faithful knights, set out on their expedition against Edward II and the government of the Spencers. From the busy port, where nevertheless they are dredging, we cross another bridge and find ourselves in a quietude like that of a cathedral close in England. On one side is a wide pool half covered with floating timber, and, in the other half reflecting like a mirror the houses on the opposite shore, with their bright gardens of lilies and hollyhocks, and trees of mountain ash, which bend their masses of scarlet berries to the still water. Between the houses are glints of blue river and of inevitable windmills on the opposite shore. 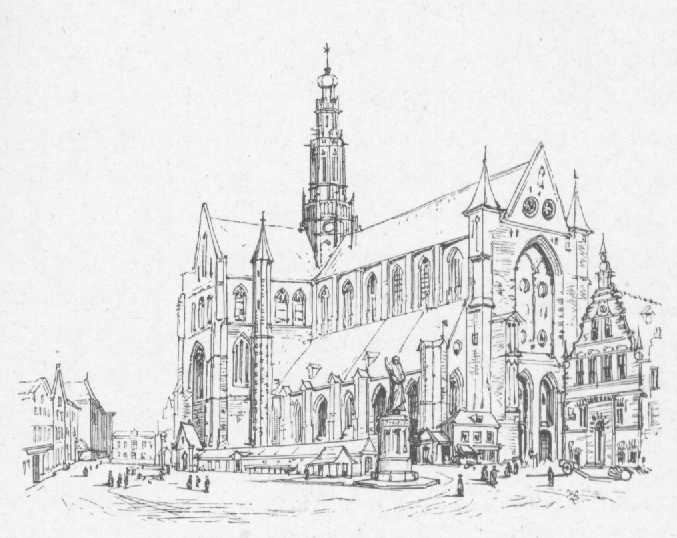 And all this we observe standing in the shadow of a huge church, the Groote Kerk, with a nave of the fourteenth century, and a choir of the fifteenth, and a gigantic brick tower, in which three long Gothic arches, between octagonal tourelles, enclose several tiers of windows. At the top is a great clock, and below the church a grove of elms, through which fitful sunlight falls on the grass and the dead red of the brick pavement (so grateful to feet sore with the sharp stones of other Dutch cities), where groups of fishermen are collecting in their blue shirts and white trousers. There is little to see inside this or any other church in Holland; travellers will rather seek for the memorials, at the Kloveniers Doelen, of the famous Synod of Dort, which was held 1618-19, in the hope of effecting a compromise between the Gomarists, or disciples of Calvin, and the Arminians who followed Zwingli, and who had recently obtained the name of Remonstrants from the 'remonstrance which they had addressed eight years before in defence of their doctrines. The Calvinists held that the greater part of mankind was excluded from grace, which the Arminians denied but at the Synod of Dort the Calvinists proclaimed themselves as infallible as the Pope, and their resolutions became the law of the Dutch reformed Church. The Arminians were forthwith outlawed ; a hundred ministers who refused to subscribe to the dictates of the Synod were banished; Hugo Grotius and Rombout Hoogerbeets were imprisoned for life at Loevestein ; the body of the secretary Ledenberg, who committed suicide in prison, was hung and Van Olden Barneveldt, the friend of William the Silent, was beheaded in his seventy-second year. There is nothing in the quiet streets of Dortrecht to remind one that it was once one of the most important commercial cities of Holland, taking precedence even of Rotterdam, Delft, Leyden, and Amsterdam. It also possessed a privilege called the Staple of Dort, by which all the carriers on the Maas and Rhine were forced to unload their merchandise here, and pay all duties imposed, only using the boats or porters of the place in their work, and so bringing a great revenue to the town. More than those in any of the other towns of Holland do the little water streets of Dortrecht recall Venice, the houses rising abruptly from the canals only the luminous atmosphere and the shimmering water changing colour like a chameleon, are wanting. Through the street of wine � Wijnstraat - built over storehouses used for the staple, we went to the Museum to see the pictures. There were two schools of Dortrecht. Jacob Geritse Cuyp (1575), Albert Cuyp (1605), Ferdinand Bol (1611), Nicolas Mraas (1632), and Schalken (1643) belonged to the former; Arend de Gelder, Arnold Houbraken, Dirk Stoop, and Ary Scheffer are of the latter. Sunshine and glow were the characteristics of the first school, greyness and sobriety of the second. But there are few good pictures at Dort now, and some of the best works of Cuyp are to be found in our National Gallery, executed at his native place and portraying the great brick tower of the church in the golden haze of evening, seen across rich pastures, where the cows are lying deep in the meadow grass. The works of Ary Scheffer are now the most interesting pictures in the Dortrecht Gallery. Of the subject 'Christus Consolator' there are two representations. In the more striking of these the pale Christ is seated amongst the sick, sorrowful, blind, maimed, and enslaved, who are all stretching out their hands to Him. Beneath is the tomb which the artist executed for his mother, Cornelia Scheffer, whose touching figure is represented lying with outstretched hands, in the utmost abandonment of repose. 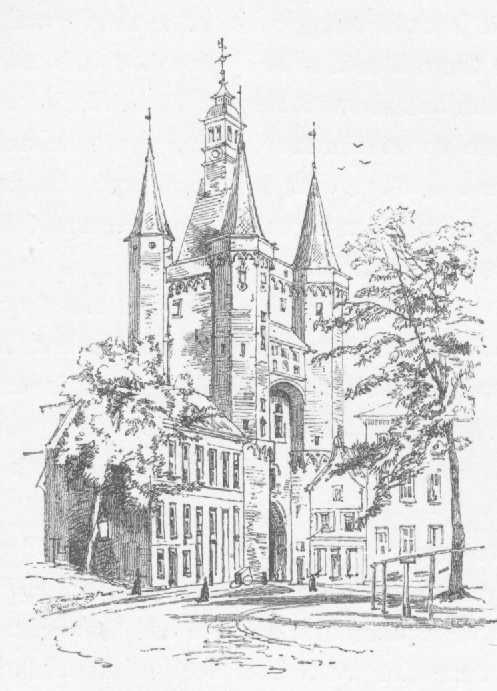 An excursion should be made from Dortrecht to the castle of Loevestein on the Rhine, where Grotius, imprisoned in 1619, was concealed by his wife in the chest which brought in his books and linen. It was conveyed safely out of the castle by her courageous maid Elsje van Houwening, and was taken at first to the house of Jacob Daatselaer, a supposed friend of Grotius, who refused to render any assistance. But his wife consented to open the chest, and the philosopher, disguised as a mason, escaped to Brabant. It is much best to visit Rotterdam as an excursion from Dortrecht. We thought it the most odious place we ever were in - immense, filthy, and not very picturesque. Its handsomest feature is the vast quay called the Boompjes, on the Maas. Here and there a great windmill reminds you unmistakably of where you are, and the land streets are intersected everywhere by water streets, the carriages being constantly stopped to let ships pass through the bridges. In the Groote Markt stands a bronze statue of Desiderius Erasmus - 'Vir saeculi sui primarius, et civis omnium praestantissimus,' which is the work of Hendrik de Keyser (1662), and in the Wijde Kerkstraat is the house where he was born, inscribed 'Haec est parva domus, magnus qua natus Erasmus, 1467,' but it is now a tavern. The great church of S. Lawrence - Groote Kerk - built in 1477-87, contains the tombs of a number of Dutch admirals, and has a grand pavement of monumental slabs, but is otherwise frightful. 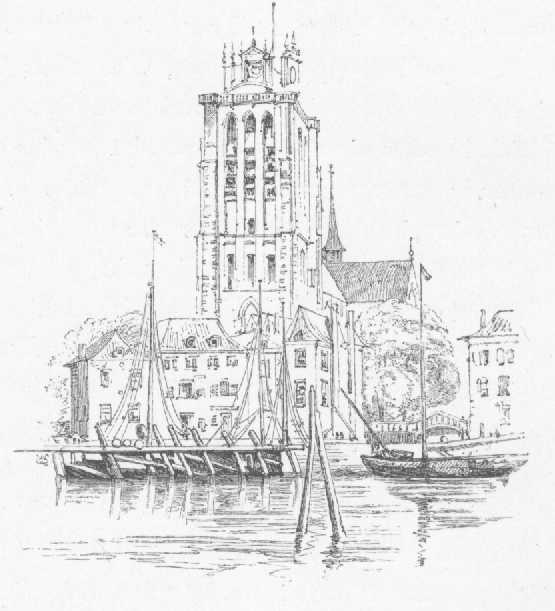 The portion used for service is said to be 'so conveniently constructed that the zealous Christians of Rotterdam prefer sleeping through a sermon there, to any other church in the city.' Part of the rest is used as a cart-house, the largest chapel is a commodious carpenter's shop, and the aisles round the part which is still a church, where there has been an attempt at restoration in painting the roof yellow and putting up some hideous yellow seats, are a play-ground for the children of the town, who are freely admitted in their perambulators, though for strangers there is a separate fee for each part of the edifice they enter. We went to see the pictures in the Museum bequeathed to the town by Jacob Otto Boyman, but did not admire them much. It takes time to accustom one's mind to Dutch art, and the endless representations of family life, with domestic furniture, pots and pans, &c., or of the simple local landscapes - clipped avenues, sandy roads, dykes, and cottages, or even of the cows, and pigs, and poultry, which seem wonderfully executed, but, where one has too much of the originals, scarcely worth the immense amount of time and labour bestowed upon them. The calm seas of Van de Welde and Van der Capelle only afford a certain amount of relief. The scenes of village life are seldom pleasing, often coarse, and never have anything elevating to offer or ennobling to recall. We thought that the real charm of the Dutch school to outsiders consists in the immense power and variety of its portraits. Hating Rotterdam, we thankfully felt ourselves speeding over the flat, rich lands to Gouda, where we found an agricultural f�te going on, banners half way down the houses, and a triumphal arch as the entrance to the square, formed of spades, rakes, and forks, with a plough at the top, and decorated with corn, potatoes, turnips, and carrots, and cornucopias pouring out flowers at the sides. In the square - a great cheese market, for the Gouda cheese is esteemed the best in Holland - is a Gothic Stadhuis, and beyond it, the Groote Kerk of 1552, of which the bare interior is enlivened by the stained windows executed by Wonter and Dirk Crabeth in 1555-57. 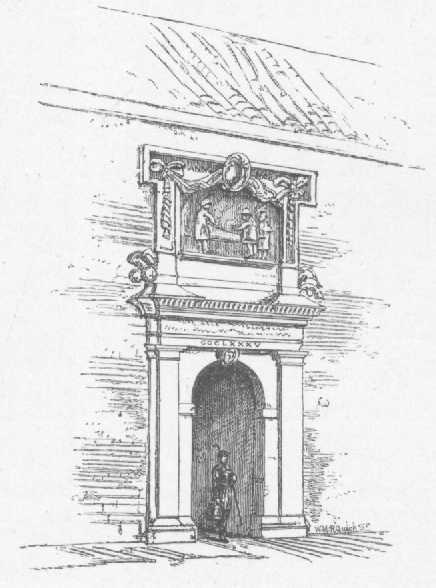 We were the better able to understand the design of these noble windows because the cartoon for each was spread upon the pavement in front of it; but one could not help one's attention being unpleasantly distracted by the number of men of the burgher class, smoking and with their hats on, who were allowed to use the church as a promenade. Gouda also made an unpleasant impression upon us, because, expensive as we found every hotel in Holland, we were nowhere so outrageously cheated as here. It is a brief journey to the Hague - La Haye, Gravenhage - most delightful of little capitals, with its comfortable hotels and pleasant surroundings. The town is still so small that it seems to merit the name of 'the largest village in Europe,' which was given to it because the jealousy of other towns prevented its having any vote in the States General till the time of Louis Bonaparte, who gave it the privileges of a city. It is said that the Hague, more than any other place, may recall what Versailles was just before the great revolution. It has thoroughly the aspect of a little royal city. Without any of the crowd and bustle of Amsterdam and Rotterdam, it is not dead like the smaller towns of Holland; indeed, it even seems to have a quiet gaiety, without dissipation, of its own. All around are parks and gardens, whence wide streets lead speedily through the new town of the rich bourgeoisie to the old central town of stallholders, where a beautiful lake, the Vijver, or fish-pond, comes as a surprise with the eccentric old palace of the Binnenhof rising straight out of its waters. We had been told it was picturesque, but were prepared for nothing so charming as the variety of steep roofs and towers, the clear reflections, the tufted islet, and the beautiful colouring of the whole scene of the Vijver. Skirting the lake, we entered the precincts of the palace through the picturesque Gudevangen Poort, where Cornelius de Witte, Burgomaster of Dort, was imprisoned in 1672, on a false accusation of having suborned the surgeon William Tichelaur to murder the Prince of Orange. He was dragged out hence and torn to pieces by the people, together with his brother Jean de Witte, Grand Pensioner, whose house remains hard by in the Kneuterdijk. 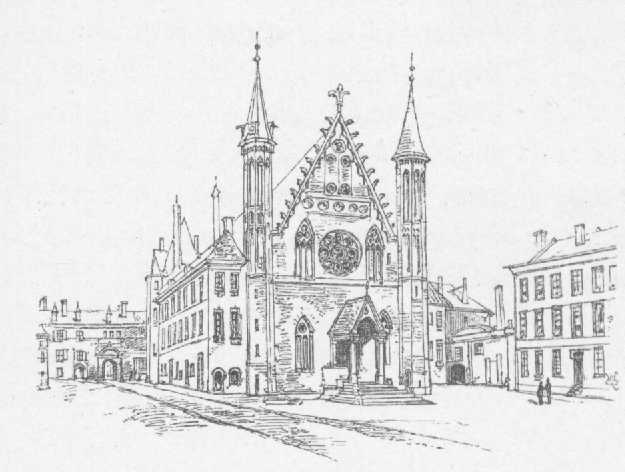 The court of the Binnenhof is exceedingly handsome, and contains the ancient Gothic Hall of the Knights, where Johann van Olden Barneveld, Grand Pensioner, or Prime Minister, was condemned to death 'for having conspired to dismember the States of the Netherlands, and greatly troubled God's Church,' and in the front of which (May 24, 1619) he was beheaded. Close to the north-east gate of the Binnenhof is the handsome house called Mauritshuis, containing the inestimable Picture Gallery of the Hague, which will bear many visits, and has the great charm of not being huge beyond the powers of endurance. On the ground floor are chiefly portraits, amongst which a simple dignified priest by Philippe de Champaigne, with a far-away expression, will certainly arrest attention. Deeply interesting is the portrait by Ravesteyn of William the Silent, in his ruff and steel armour embossed with gold - a deeply lined face, with a slight peaked beard. His widow, Louise de Coligny, is also represented. There is a fine portrait by Schalcken of our William the Third. Noble likenesses of Sir George Sheffield and his wife Anna Wake, by Vandyke, are a pleasing contrast to the many works of Rubens. There are deeply interesting portraits by Albert D�rer and Holbein. HALL OF THE KNIGHTS, THE HAGUE. On the first floor we must sit down before the great picture which Rembrandt painted in his twenty-sixth year (1632) of the School of Anatomy. Here the shrewd professor, Nicholaus Tulp, with a face brimming with knowledge and intelligence, is expounding the anatomy of a corpse to a number of members of the guild of surgeons, some of whom are full of eager interest and inquiry, whilst others are inattentive: the dead figure is greatly foreshortened and not repulsive. In another room, a fine work of Thomas de Keyser represents the Four Burgomasters of Amsterdam hearing of the arrival of Marie de Medicis. A beautiful work of Adrian van Ostade is full of light and character but only represents a stolid boor drinking to the health of a fiddler, while a child plays with a dog in the background. A group of admirers will always be found round 'the Immortal Bull' of Paul Potter, which was considered the fourth picture in importance in the Louvre, when the spoils of Europe were collected at Paris. De Amicis says, 'It lives, it breathes; with his bull Paul Potter has written the true Idyl of Holland.' It is, however - being really a group of cattle - not a pleasing, though a life-like picture. Much more attractive is the exquisite 'Presentation' of Rembrandt (1631), in which Joseph and Mary, simple peasants, present the Holy Child to Simeon, a glorious old man in a jewelled robe, who invokes a blessing upon the infant, while other priests look on with interest. A wonderful ray of light, falling upon the principal group, illuminates the whole temple. Perhaps the most beautiful work in the whole gallery is the Young Housekeeper of Gerard Dou. A lovely young woman sits at work by an open window looking into a street. By her side is the baby asleep in its cradle, over which the maid is leaning. The light falls on the chandelier and all the household belongings of a well-to-do citizen in all there is the same marvellous finish; it is said that the handle of the broom took three days to paint. There is not much to discover in the streets of the Hague. In the great square called the Plein is the statue of William the Silent, with his finger raised, erected in 1848 'by the grateful people to the father of their fatherland.' In the fish-market, tame storks are kept for the same reason that bears are kept at Berne, because storks are the arms of the town. But the chief attraction of the place lies in its lovely walks amid the noble beeches and oaks of the Bosch, beyond which on the left is Huis ten Bosch, the Petit Trianon of the Hague, the favourite palace of Queen Sophie, who held her literary court and died there. 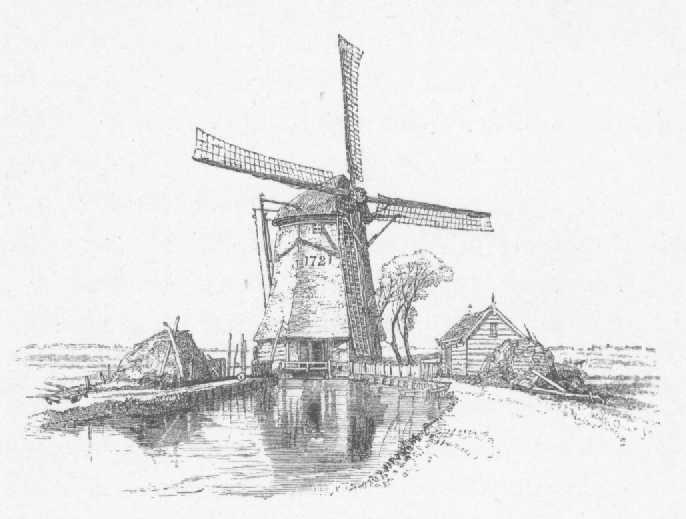 It is a quiet country house, looking out upon flats, with dykes and a windmill. All travellers seem to visit it, - which must be a ceaseless surprise to the extortionate custode to whom they have to pay a gulden a head, and who will hurry them rapidly through some commonplace rooms in which there is nothing really worth seeing. One room is covered with paintings of the Rubens school, amid which, high in the dome, is a portrait of the Princess Amalia of Solms, who built the house in 1647. A tram takes people for twopence halfpenny to Scheveningen through the park, a thick wood with charming forest scenery. As the trees become more scattered, the roar of the North Sea is heard upon the shore. 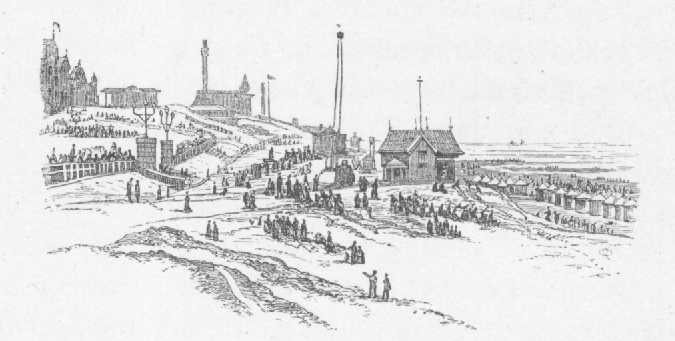 Above the sands, on the dunes or sand-hills, which extend from the Helder to Dunkirk, is a broad terrace, lined on one side by a row of wooden pavilions with flags and porticoes, and below it are long lines of tents, necessary in the intense glare, while, nearer the waves, are thousands of beehive-like refuges, with a single figure seated in each. The flat monotonous shore would soon pall upon one, yet through the whole summer it is an extraordinary lively scene. The placid happiness of Dutch family life has here taken possession. On Sunday afternoons, especially, the sands seem as crowded with human existence as they are represented in the picture of Lingelbach, which we have seen in the Mauritshuis, portraying the vast multitude assembled here to witness the embarkation of Charles II. for England. An excursion must be made to Delft, only twenty minutes distant from the Hague by rail. Pepys calls it 'a most sweet town, with bridges and a river in every street,' and that is a tolerably accurate description. It seems thinly inhabited, and the Dutch themselves look upon it as a place where one will die of ennui. It has scarcely changed with two hundred years. The view of Delft by Van der Meer in the Museum at the Hague might have been painted yesterday. All the trees are clipped, for in artificial Holland every work of Nature is artificialised. At certain seasons, numbers of storks may be seen upon the chimney-tops, for Delft is supposed to be the stork town par excellence. Near the shady canal Oude Delft is a low building, once the Convent of S. Agata, with an ornamented door surmounted by a relief, leading into a courtyard. It is a common barrack now, for Holland, which has no local histories, has no regard whatever for its historic associations or monuments. Yet this is the greatest shrine of Dutch history; for it is here that William the Silent died. ENTRANCE TO S. AGATA, DELFT. Philip II. had promised 25,000 crowns of gold to any one who would murder the Prince of Orange. An attempt had already been made, but had failed, and William refused to take any measures for self-protection, saying, 'It is useless: my years are in the hands of God: if there is a wretch who has no fear of death, my life is in his hand, however I may guard it.' At length, a young man of seven-and-twenty appeared at Delft, who gave him self out to be one Guyon, a Protestant, son of Pierre Guyon, executed at Besan�on for having embraced Calvinism, and declared that he was exiled for his religion . Really he was Balthazar Gerard, a bigoted Catholic but his conduct in Holland soon procured him the reputation of an evangelical saint. The Prince took him into his service and sent him to accompany a mission from the States of Holland to the Court of France, whence he returned to bring the news of the death of the Duke of Anjou to William. At that time the Prince was living with his court in the convent of S. Agata, where he received Balthazar alone in his chamber. The moment was opportune, but the would-be assassin had no arms ready. William gave him a small sum of money and bade him hold himself in readiness to be sent back to France. With the money Balthazar bought two pistols from a soldier (who afterwards killed himself when he heard the use which was made of the purchase). On the next day, June 10, 1584, Balthazar returned to the convent as William was descending the staircase to dinner, with his fourth wife, Louise de Coligny (daughter of the Admiral who fell in the massacre of S. Bartholomew), on his arm. He presented his passport and begged the Prince to sign it, but was told to return later At dinner the Princess asked William who was the young man who had spoken to him, for his expression was the most terrible she had ever seen. The Prince laughed, said it was Guyon, and was as gay as usual. Dinner being over, the family party were about to remount the staircase. The assassin was waiting in a dark corner at the foot of the stairs, and as William passed he discharged a pistol with three balls and fled. The Prince staggered, saying, 'I am wounded God have mercy upon me and my poor people.' His sister Catherine van Schwartzbourg asked, 'Do you trust in Jesus Christ?' He said, 'Yes,' with a feeble voice, sat down upon the stairs, and died. Balthazar reached the rampart of the town in safety, hoping to swim to the other side of the moat, where a horse awaited him. But he had dropped his hat and his second pistol in his flight, and so he was traced and seized before he could leap from the wall. Amid horrible tortures, he not only confessed, but continued to triumph in his crime. His judges believed him to be possessed of the devil. The next day he was executed. His right hand was burnt off in a tube of red-hot iron: the flesh of his arms and legs was torn off with red-hot pincers; but he never made a cry. It was not till his breast was cut open, and his heart torn out and flung in his face, that he expired. His head was then fixed on a pike, and his body cut into four quarters, exposed on the four gates of the town. Close to the Prinsenhof is the Oude Kerk with a leaning tower. It is arranged like a very ugly theatre inside, but contains, with other tombs of celebrities, the monument of Admiral van Tromp, 1650 - 'Martinus Harberti Trompius' - whose effigy lies upon his back, with swollen feet. 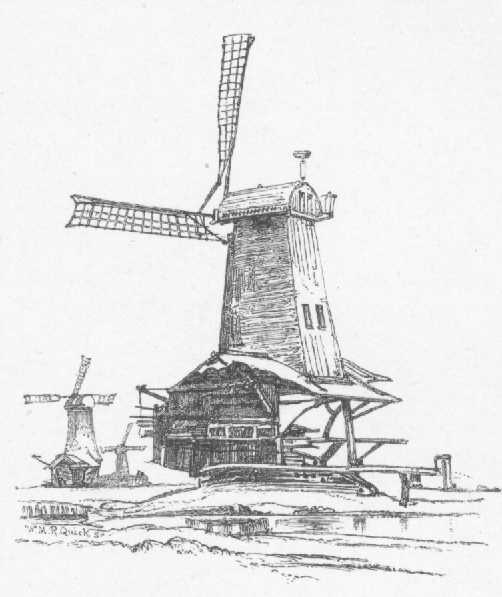 It was this Van Tromp who defeated the English fleet under Blake, and perished, as represented on the monument, in an engagement off Scheveningen. It was he who, after his victory over the English, caused a broom to be hoisted at his mast-head to typify that he had swept the Channel clear of his enemies. On leaving the Hague a few hours should be given to the dull university town of Leyden, unless it has been seen as an afternoon excursion from the capital. This melancholy and mildewed little town, mouldering from a century of stagnation, the birthplace of Rembrandt, surrounds the central tower of its Burg - standing in the grounds of an inn, which exacts payment from those who visit it. Close by is the huge church of S. Pancras - Houglansche Kerk - of the fifteenth century, containing the tomb of Van der Werff, burgomaster during the famous siege, who answered the starving people, when they came demanding bread or surrender, that he had 'sworn to defend the city; and, with God's help, he meant to keep his oath, but that if his body would help them to prolong the defence, they might take it and share it amongst those who were most hungry.' 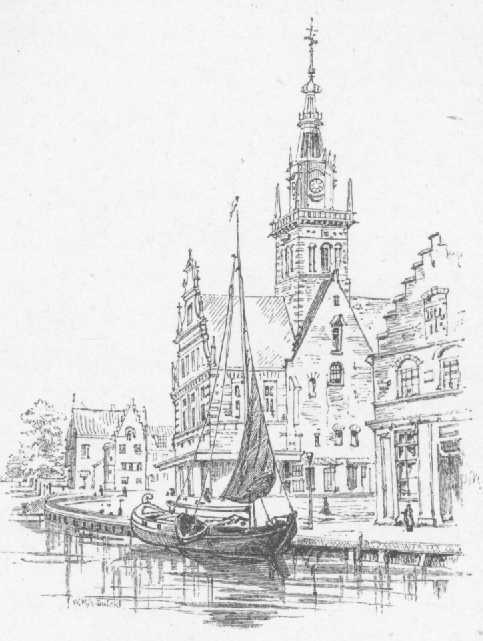 A covered bridge over a canal leads to the Bredenstrasse, where there is a picturesque grey stone Stadhuis of the sixteenth century; It contains the principal work of Cornelius Engelbrechtsen of Leyden (1468-1533), one of the earliest of Dutch painters an altarpiece representing the Crucifixion, with the Sacrifice of Abraham and Worship of the Brazen Serpent in the side panels, as symbols of the Atonement on the pedestal is a naked body, out of which springs a tree-the tree of life - and beside it kneel the donors. 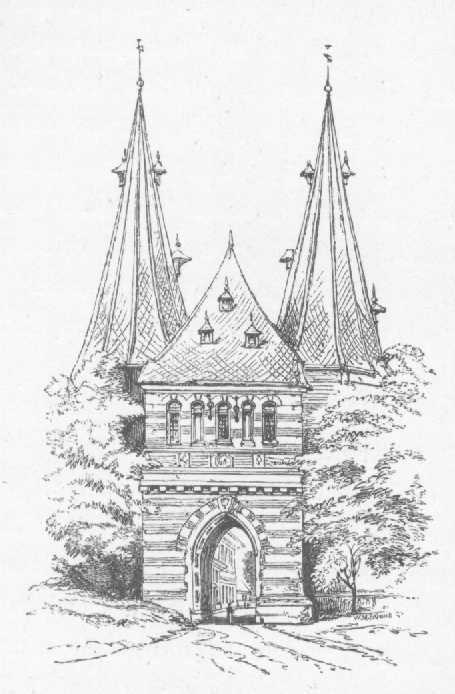 The neighbouring church of S. Peter (1315) contains the tomb of Boerhaave, the physician, whose lectures in the University were attended by Peter the Great, and for whom a Chinese mandarin found '� l'illustre M. Boerhaave, m�decin, en Europe' quite sufficient direction. Boerhaave was the doctor who said that the poor were his best patients, for God paid for them. The streets are grass-grown, the houses damp, the canals green with weed. 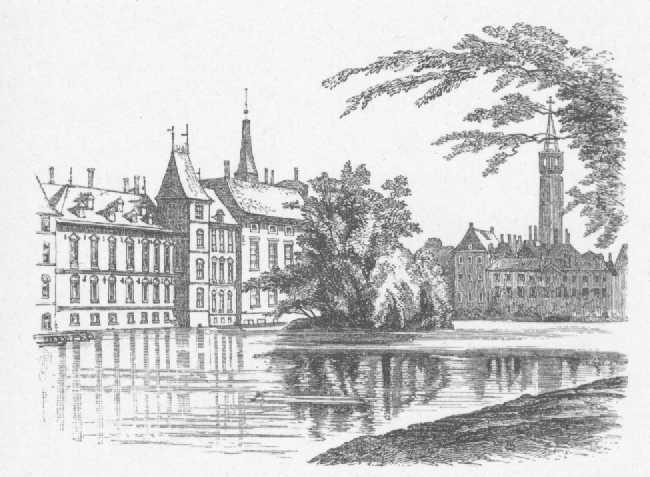 The University has fallen into decadence since others were established at Utrecht, Groningen, and Amsterdam but Leyden is still the most flourishing of the four. When William of Orange offered the citizens freedom from taxes, as a reward for their endurance of the famous siege, they thanked him, but said they would rather have a university. Grotius and Cartesius (Descartes), Arminius and Gemar, were amongst its professors, and the University possesses an admirable botanical museum and a famous collection of Japanese curiosities. The Rhine cuts up the town of Leyden into endless islands, connected by a hundred and fifty bridges. On a quiet canal near the Beesten Markt is the Museum, which contains the 'Last Judgment' of Lucas van Leyden (1494-1533), a scholar of Engelbrechtsen, and one of the patriarchs of Dutch painting. A few minutes bring us from Leyden to Haarlem by the railway. It crosses an isthmus between the sea and a lake which covered the whole country between Leyden, Haarlem, and Amsterdam till 1839, when it became troublesome, and the States-General forthwith, after the fashion of Holland, voted its destruction. Enormous engines were at once employed to drain it by pumping the water into canals, which carried it to the sea, and the country was the richer by a new province. Haarlem. on the river Spaarne, stands out distinct in recollection from all other Dutch towns, for it has the most picturesque market-place in Holland - the Groote Markt - surrounded by quaint houses of varied outline, amidst which rises the Groote Kerk of S. Bavo, a noble cruciform fifteenth-century building. The interior, however, is as bare and hideous as all other Dutch churches. It contains a monument to the architect Conrad, designer of the famous locks of Katwijk, 'the defender of Holland against the fury of the sea and the power of tempests.' Behind the choir is the tomb of the poet Bilderdijk, who only died in 1831, and near this the grave of Laurenz Janzoom - the Coster or Sacristan - who is asserted in his native town, but never believed outside it, to have been the real inventor of printing, as he is said to have cut out letters in wood, and taken impressions from them in ink, as early as 1423. His partisans also maintain that whilst he was attending a midnight mass, praying for patience to endure the ill-treatment of his enemies, all his implements were stolen, and that when he found this out on his return he died of grief. 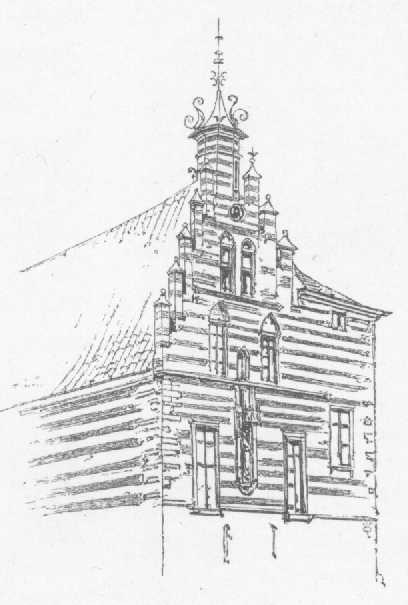 It is further declared that the robber was Faust of Mayence, the brother of Gutenberg, and that it was thus that the honour of the invention passed from Holland to Germany, where Gutenberg produced his invention of movable type twelve years later There is a statue of the Cost�r in front of the church, and, on its north side, his house is preserved and adorned with his bust. Amongst a crowd of natives with their hats on, talking in church as in the market-place, we waited to hear the famous organ of Christian Muller (1735-38) and grieviously were we disappointed with its discordant noises. All the men smoked in church, and this we saw repeatedly; but it would be difficult to say where we ever saw a Dutchman with a pipe out of his mouth. Every man seemed to be systematically smoking away the few wits he possessed. Opposite the Groote Kerk is the Stadhuis, an old palace of the Counts of Holland remodelled. It contains a delightful little gallery of the works of Franz Hals, which at once transports the spectator into the Holland of two hundred years ago - such is the marvellous variety of life and vigour impressed into its endless figures of stalwart officers and handsome young archers pledging each other at banquet tables and seeming to welcome the visitor with jovial smiles as he enters the chamber, or of serene old ladies, 'regents' of hospitals, seated at their council boards. The immense power of the artist is shown in nothing so much as in the hands, often gloved, dashed in with instantaneous power, yet always having the effect of the most consummate finish at a distance. Behind one of the pictures is the entrance to the famous 'secret-room of Haarlem,' seldom seen, but containing an inestimable collection of historic relics of the time of the famous siege of Leyden. April and May are the best months for visiting Haarlem, which is the bulb nursery garden of the world. 'Oignons � fleurs' are advertised for sale everywhere. Tulips are more cultivated than any other flowers, as ministering most to the national craving for colour but times are changed since a single bulb of the tulip 'L'Amiral Liefkenshoch' sold for 4,500 florins, one of 'Viceroy' for 4,200, and one of 'Semper Augustus' for 13,000. Now we entered Amsterdam, to which we had looked forward as the climax of our tour, having read of it and pondered upon it as 'the Venice of the north;' but our expectations were raised much too high. Anything more unlike Venice it would be difficult to imagine: and there is a terrible want of variety and colour; many of the smaller towns of Holland are far more interesting and infinitely more picturesque. A castle was built at Amsterdam in 1204, but the town only became important in the sixteenth century, since which it has been the most commercial of ancient European cities. It is situated upon the influx of the Amstel to the Y, as the arm of the Zuider Zee which forms the harbour is called, and it occupies a huge semicircle, its walls being enclosed by the broad moat, six and a half miles long, which is known as Buitensingel. The greater part of the houses are built on piles, causing Erasmus to say that the inhabitants lived on trees like rooks. In the centre of the town is the great square called Dam, one side of which is occupied by the handsome Royal Palace - Het Palais - built by J. van Kampen in 1648. The Nieuwe Kerk (1408-1470) contains a number of monuments to admirals, including those of Van Ruiter - 'immensi tremor oceani' who commanded at the battle of Solbay, and Van Speyk, who blew himself up with his ship in 1831, rather than yield to the Belgians. In the Oude Kerk of 1300 there are more tombs of admirals. Hard by, in the Nieuwe Markt, is the picturesque cluster of fifteenth-century towers called S. Anthonieswaag, once a city gate and now a weighing-house. But the great attraction of Amsterdam is the Picture Gallery of the Trippenhuis, called the Rijks Museum, and it deserves many visits. Amongst the portraits in the first room we were especially attracted by that of William the Silent in his skull-cap, by Miereveld, but all the House of Orange are represented here from the first to the last We also see all the worthies of the nation - Ruyter, Van Tromp and his wife, Grotius and his wife, Johann and Cornelis de Witt, Johann van Oldenharneveldt, and his wife Maria of Utrecht, a peaceful old lady in a ruff and brown dress edged with fur, by Moreelse. The two great pictures of the gallery hang opposite each other. That by Bartholomew van der Heist, the most famous of Dutch portrait-painters, represents the Banquet of the Musqueteers, who thus celebrated the Peace of Westphalia, June 18, 1648. It contains twenty-five life-size portraits, is the best work of the master, and was pronounced by Sir Joshua Reynolds to be the 'first picture of portraits in the world.' The canvas is a mirror faithfully representing a scene of actual life. In the centre sits the jovial, rollicking Captain de Wits with his legs crossed. The delicate imitation of reality is equally shown in the Rhenish wine-glasses, and in the ham to which one of the guests is helping himself. The rival picture is the ' Night Watch ' of Rembrandt (1642), representing Captain Frans Banning Kok of Purmerland and his lieutenant Willem van Ruytenberg of Vlaardingen, emerging from their watch-house on the Singd. A joyous troop pursue their leader, who is in a black dress. A strange light comes upon the scene, who can tell whence? Half society has always said that this picture was the marvel of the world, half that it is unworthy of its artist but no one has ever been quite indifferent to it. Through the labyrinthine quays we found our way to the Westerhoof to take the afternoon steamer to Purinerende for an excursion to Broek, 'the cleanest village in the world.' 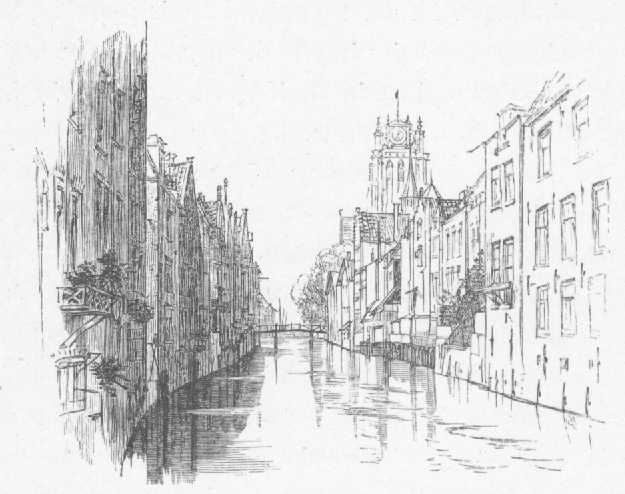 Crossing the broad Amstel, the vessel soon enters a canal, which sometimes lies at a great depth, nothing being visible but the tops of masts and points of steeples; and which then, after passing locks, becomes level with the tops of the trees and the roofs of the houses. We left the steamer at T Schouw, and entered, on a side canal, one of the trekschuiten, which, until the time of railroads, were the usual means of travel - a long narrow cabin, encircled by seats, forms the whole vessel, and is drawn by a horse ridden by a boy (hetjagerte) - a most agreeable easy means of locomotion, for movement is absolutely imperceptible. No place was ever more exaggerated than Broek. There is really very little remarkable in it, except even a greater sense of dampness and ooziness than in the other Dutch villages. It was autumn, and there seemed no particular attempt to remove the decaying vegetation or trim the little gardens, or to sweep up the dead leaves upon the pathways, yet there used to he a law that no animal was to enter Broek for fear of its being polluted. A brick path winds amongst the low wooden cottages, painted blue, green, and white, and ends at the church, with its miniature tombstones. The most interesting excursion to be made from Amsterdam is that to the Island of Marken in the Zuider Zee - a huge meadow, where the peasant women pass their whole lives without ever seeing anything beyond their island, whilst their husbands, who with very few exceptions are fishermen, see nothing beyond the fisher-towns of the Zuider Zee. There are very picturesque costumes here, the men wearing red woollen shirts, brown vests, wooden shoes, fur caps, and gold buttons to their collars and knickerbockers the women, embroidered stomachers, which are handed down for generations, and enormous white caps, lined with brown to show off the lace, and with a chintz cover for week days, and their own hair flowing below the cap over their shoulders and backs. An evening train, with an old lady, in a diamond tiara and gold pins, for our companion, took us to the Holder, and we awoke next morning at the pleasant little inn of Du Burg upon a view of boats and nets and the low-lying Island of Texel in the distance. The boats and the fishermen are extremely picturesque, but there is nothing else to see, after the visitor has examined the huge granite Helder Dyke, the artificial fortification of north Holland, which contends successfully to preserve the land against the sea. There is an admirably managed Naval Institute here. It was by an expedition from the Helder that Nova Zembla was discovered, and it was near this that Admirals Ruyter and Tromp repulsed the English fleet. Texel, which lies opposite the Helder, is the first of a chain of islands - Vlieland, Terscholling, and Amoland, which protect the entrance of the Zuider Zee. The country near the Helder is bare and desolate in the extreme. It is all peat, and the rest of Holland uses it as a fuel mine. It was here that the genius of Ruysdael was often able to make a single tree, or even a bush rising out of the flat by a stagnant pool, both interesting and charming to the spectator. We crossed the levels to Alkmaar, which struck us as being altogether the prettiest place in the country and as possessing all those attributes of cleanliness which are usually given to Broek. The streets, formed of bricks fitted close together, are absolutely spotless, and every house front shines fresh from the mop or the syringe. Yet excessive cleanliness has not destroyed the picturesqueness of the place. The fifteenth-century church of S. Lawrence, of exquisitely graceful exterior, rises in the centre of the town, and, in spite of being hideously defaced inside, has a fine vaulted roof, a coloured screen, and, in the chancel, a curious tomb to Florens V., Count of Holland, 1295, though only his heart is buried there. Near the excellent H�tel du Burg is a most bewitching almshouse, with an old tourelle and screen, and a lovely garden in a court surrounded by clipped lime-trees. And more charming still is an old weigh-house of 1582, for the cheese, the great manufacture of the district, for which there is a famous market every Friday, where capital costumes may be seen. The rich and gaily painted facade of the old building, reflected in a clear canal, is a perfect marvel of beauty and colour; and artists should stay here to paint - not the view given here, but another which we discovered too late - more in front, with gable-ended houses leading up to the principal building, and all its glowing colours repeated in the water. It is three hours' drive from Alkmaar to Hoorn, a charming old town with bastions, gardens, and semi-ruined gates. On the West Poort a relief commemorates the filial devotion of a poor boy, who arrived here in 1579, laboriously dragging his old mother in a sledge, when all were flying from the Spaniards. Opposite the weighing-house for the cheeses is the State College, which bears a shield with the arms of England, sustained by two negroes. It commemorates the fact that when Van Tromp defeated the English squadron, his ships came from Hoorn and on board were two negroes, who took from the English flagship the shield which it was then the custom to fix to the stern of a vessel, and brought it back here as a trophy. 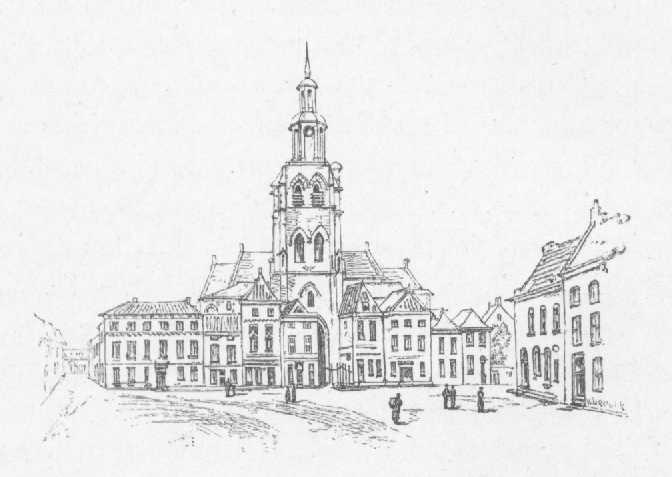 Hoorn was one of the first places in Holland to embrace the reformed religion, which spread from hence all over the country, but now not above half the inhabitants are Calvinists. In returning from Alkmaar we stopped to see Zaandam, quite in the centre of the land of windmills, of which we counted eighty as visible from the station alone. They are of even shade of colour, and are mounted on poles, on towers, on farm buildings, and made picturesque by every conceivable variety of prop, balcony, gallery, and insertion. Zaandam is a very pretty village on the Zaan which flows into the Y, with gaily painted houses, and gay little gardens, and perpetual movement to and from its landing-stage. Turning south from thence, a little entry on the right leads down some steps and over a bridge to some cottages on the bank of a ditch, and inside the last of these is the tiny venerable hovel where Peter the Great stayed in 1697 as Peter Michaeloff. It retains its tiled roof and contains some old chairs and a box-bed, but unfortunately Peter was only here a week. The evening of leaving Zaandam we spent at Utrecht, of which the name is so well known from the peace which terminated the war of the Spanish succession, April 11, 1715. 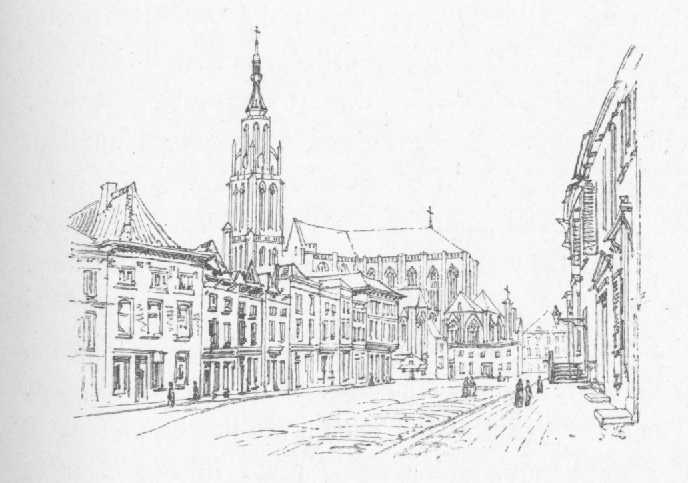 The town, long the seat of an ecclesiastical court, was also the great centre of the Jansenists, dissenters from Roman Catholicism under Jansenius, Bishop of Ypres, condemned by Alexander VII. in 1656, at the instigation of the Jesuits. The doctrines of Jansenius still linger in its gloomy houses. Every appointment of a bishop is still announced to the Sovereign Pontiff, who as regularly responds by a bull of excommunication, which is read aloud in the cathedral, and then immediately put away and forgotten. Solemn and sad, but preeminently respectable, Utrecht has more the aspect of a decayed German city than a Dutch town, and so has its Cathedral of S. Martin (1254-67), which, though the finest Gothic building in Holland, is only a magnificent fragment, with a detached tower (1321-82) 338 feet high. The interior as usual is ruined by Calvinism and yellow paint. It contains the tomb of Admiral van Gent, who fell in the battle of Solbay. The nave, which fell in 1674, has never been rebuilt. The S. Pieterskerk (1039) and S. Janskerk offer nothing remarkable, but on a neighbouring canal is the quaint Paushuizen, or Pope's house, which was built by Pope Adrian VI. (Adrian Floriszoom) in 1517. Near this is the pretty little Archiepiscopal Museum, full of medi�val relics. The interesting Moravian establishment of Zeist may be visited from Utrecht. At Zwolle, however, we found the Kroon an excellent hotel with an obliging landlord; and Zwolle, the native place of Terburg (1608), is a charming old town with a girdle of gardens, a fine church (externally), and a noble brick gateway called the Sassenpoort. It was more the desire of seeing something of the whole country than anything else, and a certain degree of misplaced confidence in the pleasant volumes of Harvard, which took us up from Zwolle, through Friesland, the cow-paradise, to Leeuwarden, its ancient capital. Sad and gloomy as most other towns of Holland are, Leeuwarden is sadder and gloomier still. Its streets are wide and not otherwise than handsome, but they are almost deserted, and there are no objects of interest to see unless a leaning tower can be called so, with a top, like that at Pisa, inclined the other way, to keep it from toppling over. An hour's walk from the town there is said to be a fine still-inhabited castle, and, if time had allowed, respect for S. Boniface would have taken us to Murmerwoude, where he was martyred (June 8, 853), with his fifty-three companions. King Pepin raised a hermitage on the spot, and an ancient brick chapel still exists there. Here and elsewhere in Friesland nothing is so worthy of notice as the helmets - the golden helmets of the women - costing something equivalent to 25l. or 30l. handed down as heirlooms, fitting close to the head, and not allowing a particle of hair to be visible. In the late evening we went on to Groningen, a university town with a good hotel (Seven Provincen), an enormous square, and a noble tall Gothic tower of 1627, whence the watchman still sounds his bugle. Not far off is Midwolde, where the village church has fine tombs of Charles Jerome, Baron d'Inhausen and his wife, Anna von Ewsum. As late as the sixteenth century this province was for the most part uninhabited - savage and sandy, and overrun by wolves. But three hundred years of hard work has transformed it into a fertile country, watered by canals, and sprinkled with country houses. Agriculturally it is one of the richest provinces of the kingdom. This is mostly due to its possessing a race of peasant-farmers who never shrink from personal hard work, and who will continue to direct the plough whilst they send their sons to the university to study as lawyers, doctors, or churchmen. These peasant farmers or boers possess the beklemregt, or right of hiring land on an annual rent, which the landlord can never increase. A peasant can bequeath his right to his heirs, whether direct or collateral. To the land, this system is an indescribable advantage, the cultivators doing their utmost to bring their lands to perfection, because they are certain that no one can take away the advantage from themselves or their descendants. On leaving Groningen we traversed the grey, monotonous, desolate district of the Drenthe, sprinkled over at intervals by the curious ancient groups of stones called Hunnebedden, or beds of death (Hun meaning death), beneath which urns of clay containing human ashes have been found. From Deventer (where there is an old weigh-house, and a cathedral of S. Lievin with a crypt and nave of 1334), time did not allow us to make an excursion to the great royal palace of Het Loo, the favourite residence of the sovereigns. The descriptions in Harvard rather made us linger unnecessarily at Zutphen, a dull town, with a brick Groote Kerk (S. Walpurgis) which has little remaining of its original twelfth-century date, and a rather picturesque bit on the walls, where the 'Waterpoort' crosses the river like a bridge. At Arnhem, the Roman Arenacum, once the residence of the Dukes of Gueldres, and still the capital of Guelderland, we seemed to have left all the characteristics of Holland behind. Numerous modern villas, which might have been built for Cheltenham or Leamington, cover the wooded hills above the Rhine. In the Groote Kerk (1452) is a curious monument of Charles van Egmont, Duc de Gueldres, 1538, but there is nothing else to remark upon. We intended to have made an excunsion hence to Cleves, but desperately wet weather set in, and, as Dutch rain often lasts for weeks together when it once begins, we were glad to hurry England-wards only regretting that we could not halt at Nymegen, a most picturesque place, where Charlemagne lived in the old palace of the Valckhof (or Waalhof, residence on the Waal), of which a fragment still exists, with an old baptistery, a Stadhuis of 1534, and a Groote Kerk containing a noble monument to Catherine de Bourbon (1469), wife of Duke Adolph of Gueldres. We left Holland feeling that we should urge our friends by all means to see the pictures at Rotterdam, the Hague, and Amsterdam, but to look for all other characteristics of the Netherlands in such places as Breda, Dortrecht, Haarlem, Alkmaar, and Zwolle.